Pumpkin just doesn’t appeal to everyone, so that’s where this alternative traditional holiday treat can come in handy. It uses the same homey spices as the Thanksgiving classic, but with sweet potatoes instead of pumpkin for a dense filling and creamy texture. 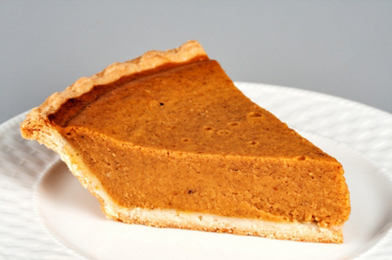 Many folks prefer sweet potato pie, not only at holiday time, but any time. We can vouch for its anti-oxidant nourishment as well as its spicy, fragrant sweetness. 1. Chill pastry until firm enough to roll, about 1 hour. 2. Preheat oven to 400F. Put sweet potatoes on a large baking sheet. Pierce them deeply with a paring knife several times. Bake until tender throughout (check with a paring knife), about 1 hour. Set aside to cool. When cool enough to handle, scoop out the flesh into a food processor and process until smooth. Dump the puree into a medium-sized bowl. Return 1 1/2 cups of the puree to the food processor. Don’t worry if you come up a little short. If you have extra, save it for another use. 2. On a sheet of lightly floured waxed paper, roll the pastry into a 12-inch circle with a floured rolling pin. Invert the pastry over a 9-inch standard pie pan, center, and peel off the paper. Tuck the pastry into the pan, without stretching it, and sculpt the edges into an upstanding ridge. Place in the freezer for 15 minutes, then remove. Cover the shell with aluminum foil and fill with dried beans to weight it. Bake at 400F for 15 minutes, then remove the foil and beans, and prick the bottom of the crust with a fork several times. Lower the oven temperature to 375F and continue to bake 10 to 12 minutes. Remove and allow to cool. 3. Reduce oven temperature to 350F. Add sugars, eggs, and egg yolk to the food processor and process with the sweet potato puree until smooth. Add the cream, vanilla, lemon juice, cinnamon, nutmeg, and salt and process again until smooth. Carefully pour the filling into the cooled pie shell. 4. Place pie in the center oven rack and bake for 30 minutes, then rotate the pie 180 degrees, so that the part that faced the back of the oven now faces forward. Continue to bake until the center is set and the edge has risen slightly, 15 to 20 minutes. 5. Transfer the pie to a wire rack and let cool. Serve barely warm or at room temperature. Or cover with loosely tented aluminum foil, refrigerate, and serve cold. Adapted from Pie, by Ken Haedrich (Harvard Common Press, 2004). Copyright (c) 2004 by Ken Haedrich. Reprinted by permission of Harvard Common Press. Adapted from Pie, by Ken Haedrich (Harvard Common Press, 2004). Although I doubt many folks here will use this fatty, non-vegan recipe, it would be very helpful to give an estimate of how many cups of mashed sweet potatoes come from 2 "large" tubers. Or give the weight of the tubers, useful for everyone except us backward types in the US who don't use kitchen scales. I make sweet potato custard with leftover baked sweet potatoes, using my own adaptation of my mom's recipe (on the label of Libby's canned pumpkin). That's my "classic" recipe, the pie I ate as a child in the 50's. This recipe looks good, but why lemon juice?